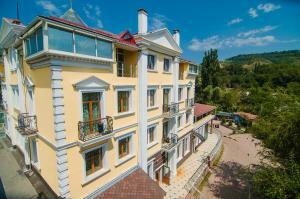 Stop at Kazzhol Hotel Almaty to discover the wonders of Almaty. The hotel has everything you need for a comfortable stay. All the necessary facilities, including free Wi-Fi in all rooms, Wi-Fi in public areas, valet parking, car park, room service, are at hand. Guestrooms are designed to provide an optimal level of comfort with welcoming decor and some offering convenient amenities like television LCD/plasma screen, carpeting, mirror, slippers, separate living room. To enhance guests' stay, the hotel offers recreational facilities such as fitness center, sauna, indoor pool, massage, steamroom. A welcoming atmosphere and excellent service are what you can expect during your stay at Kazzhol Hotel Almaty.